What cases do you have for the Xr? The Evutec holder is rubbish doesn't clip in the magnetic back properly, case doesn't sit flat has camera hump, returning. Long wait for the Sheath now. I’m using spigen liquid crystal for my coral XR. When I'm at home, I use Luvvitt's Crystal View case (works great when I'm wirelessly charging my phone). When I head out, I switch to a clear silicone case with red along the edges and a red metallic finger loop on the back. I love the way that case looks - it really shows off the red color of my XR beautifully. Have a Caudabe Sheath and a Lucid clear coming. Yes they do but they are just too slippery to use, the phone naked has better grip. Returning it, still have the Sheath coming, have had one before and they have good grip. It's hard to get a good all round case these days. I have the silk smartish nudist clear case. The back is frosted which provides grip. Phone fits snuggly in the case. Came with a free screen protector as well! I have a speck grip and glitter in purple and an otter box commuter. Love this case! Which color phone are you using with the nudist case? Just got my iPhone XR. Picked up a black Incipio Dual Pro case. Nice case and good grip. pr1nce and libra89 like this. Kinda thinking about returning the commuter, and getting either a OtterBox Pursuit case, or a lifeproof. I’ve always used lifeproofs and defenders, but one downside is defenders don’t have a screen protector now. I would have to put a cheap one on every time I wanted to swap, so pursuit may be a better choice now. Anyone tried either of these yet? Got the OtterBox Statement Modern from Apple today. At first i thought this is just too big after using the Sheath. But the protection is there i wouldn't trust the Sheet in a drop. But its growing on me and is actually a really nice feeling case to hold and a great fit. Better than the Symmetry for the Max i had. If i had to pick anything mute switch is a bit deep as its a bit wider case than the Symmetry. Leather back is really nice to hold and smells real. I was going to return and rang Apple they said keep it and did a refund, thank you $69.95Aud case for free. The back looks ok with the White XR too. Wow, what did you say when you called? I got the Otterbox Figura and didn't like it so I returned it to Apple. Because i am 5 hours from a store, they seem to just refund rather than pay postage/courier i think. They did it for a battery case too because of the battery wouldn't take back via post/courier. Also a 11" folio case. What didn't you like about the Figura? if you got a otterbox symmetry case i heard the buttons are removable have you tried these to see if they fit ?? they probly wont but what if they do ? 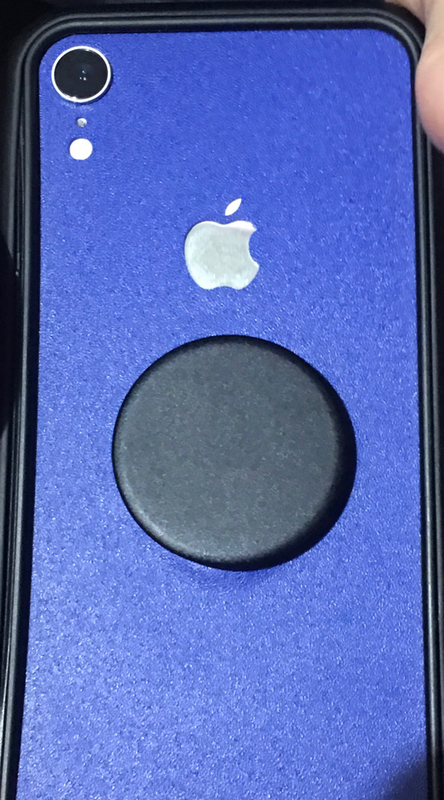 I was thinking about doing the same setup, my question is; when the pop socket is all the way in, does it stick out farther than the rhinoshield? Can you lay it flat on its back, without the popsocket being in the way? I noticed there weren't any IKEA TRÅDFRI reviews by you guys.